This weekend was the Outlaw Trail bike ride up in Round Rock. This ride’s been going on and I’ve been attending it for about as long as I’ve lived in Texas. The routes have changed over the years – it used to take you west over toward Cedar Park in the early 90’s – but in more recent years, they just head north up beyond Wier, TX. There’s too much traffic to the west. I woke up to rain Saturday morning and I contemplated not going this year. It hasn’t rained more than a few drops here since some time in the spring so I’m ok with it raining, even if I have to cancel a bike ride. But, by all accounts, the rain was not going to last long. There wasn’t even anything showing on the radar. So I loaded up the bike and headed to Round Rock. Sure enough, 8 miles or so down the road the rain stopped and it was dry as a bone. Several other friends were also riding Saturday morning and Kem and Tony pulled in right after I’d gotten there. Skies seemed to suggest we weren’t going to see any more rain for awhile so we got ready and hit the road about 8 with everyone else at the mass start. Despite the fact there wasn’t any rain, conditions were less than ideal. We had a wind coming out of the southeast gusting to 20+. For a ride that headed to the northeast that made for a pretty nice start to the ride. For about the first 20 miles we had a pretty decent tail wind or a little cross wind. 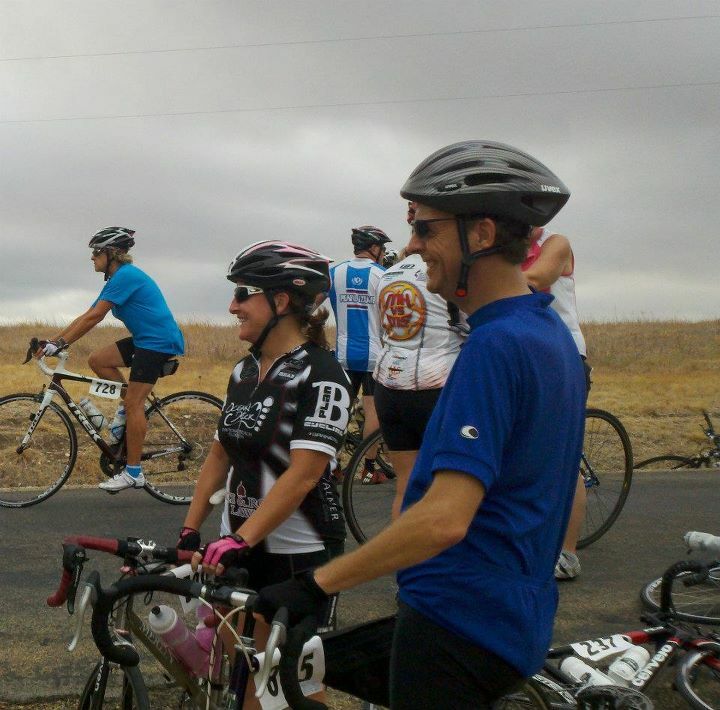 As you can see in the photo here, at the first rest stop we were all smiles. With that wind, we were easily riding at a 20+ mph pace. Kem’s in the photo too and it was taken by Tony. Of course, we realized that we’d have to turn back into the wind at some point. As such I was pretty sure I was going to prefer the 40-something miler instead of the 50 miler. We rode the 50 mile route for awhile but we took the opportunity to veer off when the routes diverged again. We spent most of the rest of the ride slogging against a tough wind. It was tough going. Gear down and hunker down. It’d have been easier if it wasn’t such open country to the northeast of Round Rock. Fields have been picked and in lots of places there’s no cover at all. Just wide open spaces and empty fields.